SAN FRANCISCO (USA Today) The most surprising thing about Amazon’s latest ad for its Prime service is that it appears to be the first time a Muslim cleric has been featured in a television ad shown in the United States. “I can’t think of one. There are plenty of religious figures in televisions, especially sitcoms and police procedurals. But no ads with imams,” said Tobe Berkovitz, a professor of advertising at Boston University. Amazon has done several wordless ads for Prime featuring people buying what it terms charming solutions for everyday problems. They include a father buying a lion’s mane for the family dog so the new baby isn’t scared of it, a dog with a broken leg getting a lift in a baby carrier and a grandfather using a leaf blower to power his granddaughter’s swing. The new ad, which begins airing in the United States, United Kingdom and Germany last Wednesday (Nov. 16), would be no different were the subject matter not so rare. Set in England, the commercial begins with an Episcopal priest opening the door for his good friend, a Muslim imam. The two older men talk, laugh and share a cup of tea, both wincing at their creaky knees as they sit and stand. After they part, both pull out their phones, tap the Prime app and order something. Next we see them getting a delivery at their respective homes and it’s clear they’ve each bought the other identical knee pads. 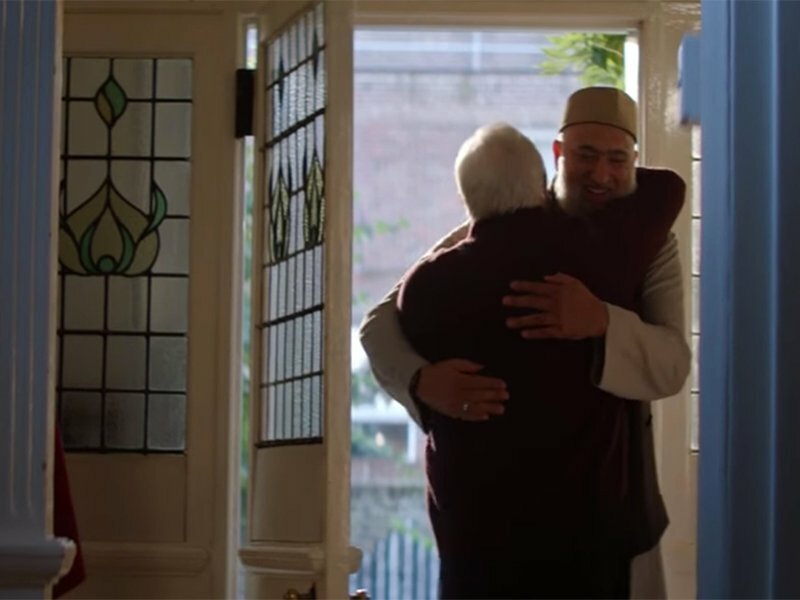 The end of the 120-second ad features both men in their respective houses of worship, kneeling in prayer. Amazon didn’t set out to make any kind of political statement and the subject had nothing to do with the recently concluded U.S. presidential election, the company was quick to say. Work on the ad had already begun in June, said Simon Morris, Amazon’s European Union director of advertising. However, it’s clear that the topic is of concern, as Amazon does not generally reach out to the press in advance about its television ads, but did with this one. Groups that track hate crimes say there has been a rise in anti-immigrant and anti-Muslim incidents since the Nov. 8 election of Donald Trump, who called for a halt to all immigrants who were Muslim during his campaign. The Amazon producers worked with several religious groups Including the Interfaith Alliance, the National Council of Churches and the Islamic Circle of North America to insure the ad was respectful, said Morris. The lead characters in the commercial are played by actual religious leaders. They are Gary Bradley, vicar at St Mary’s and Paddington Green in London and Zubier Mohammad, principal of the Muslim School Oadby in Leicester, Morris said. The advertisement was filmed at two churches, St. Dunstan and All Saints Stepney Church in London, and at the East London Mosque. While Muslims are a small minority in the United States, making up just under 1 percent of the U.S. population, there are 3.3 million of them and there have been Muslim communities in the country for decades. Despite that, advertising professors and historians had to think hard about whether an Islamic religious leader had ever been depicted in an ad. “We certainly have used priests, nuns, ministers, rabbis and many other clerical types, but I have no memory of a Muslim Cleric ever being used,” said John Verret, who worked in advertising for 40 years and now faculty advisor to the Boston University AdLab, a student-run advertising agency. That could be because advertisers have faced backlash in the past. In 2011 Lowe’s pulled ads from a TLC reality series, All-American Muslim, because of pressure from a Florida conservative group that objected to the fact that the show depicted Muslims as “ordinary folks while excluding many Islamic believers whose agenda poses a clear and present danger to liberties and traditional values that the majority of Americans cherish.” The show was later cancelled. In England, where Muslims make up 5 percent of the population, the ad follows the U.K.’s vote to leave the European Union. The so-called Brexit referendum stemmed in part with dissatisfaction with a surge in immigration and set off a wave of attacks on Poles and Muslims in late June. While holiday ads are just ads in the United States, they have a whole different cultural connotation in the United Kingdom. There, the annual arrival of “Christmas adverts” is awaited with the same anticipation that is reserved for Super Bowl ads in the United States. I saw the commercial and found it to be just fine as well as amusing. Getting on a bit in years myself, I can appreciate the like gesture between two individuals faced with the growing infirmities of age, regardless of spiritual perspective. I like the ad too. Its too bad “All American Muslim” was pressured off tv. It’s all warm and fuzzy. But not realistic. One’s “holy book” calls the other a blasphemer for his belief in the Trinity and says that hell will be his abode, and it also calls for the deaths/ dismemberment of all apostates and kafir…which would be the head of this priest. I bet ISIS gets a kick outta this. Meanwhile the two men in this commercial are actual friends in real life.